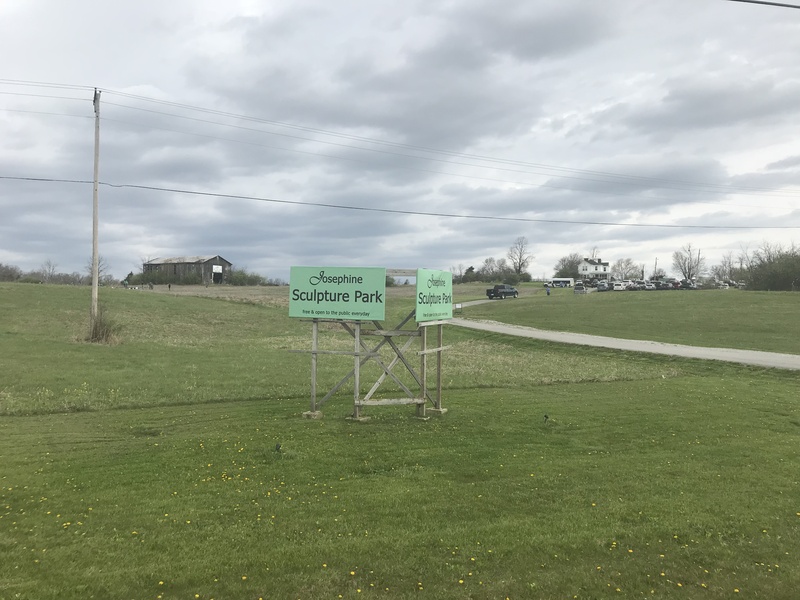 Despite the rainy weather, droves of people showed up at Josephine Sculpture Park Saturday, April 14 to plant about 2,000 tree seedlings and support Reforest Frankfort, Kentucky. A family at the event looks to pick a spot to begin work. Energy and Environment Cabinet (EEC) employees were among the volunteers and could be seen planting trees, showing community members proper technique and working informational booths. Signs were hung in the area to direct volunteers. Many trees had already been planted shortly after the event began. Many families joined in on the fun and set a great example for their little ones. Twenty three species of trees, purchased from the KDF tree nurseries, were planted during the event. When grown, the trees will clean the air, manage storm waters, prevent erosion, slow winds and buffer noises, and give a welcome vista. Lee Colten, far right, chats with friends at the event. Attendees were able to learn about the ecosystem needed for trees to thrive. Dale Booth, an Environmental Scientist with the state’s Division of Water explained nonpoint source pollution using macroinvertebrates to demonstrate stream health. Dragonfly nymphs, mayflies, snails and leeches spend some or all of their life-cycles in streams and their presence – and health – can demonstrate water quality. Dale Booth uses a model called an Enviroscape, which is used to talk about and demonstrate what a watershed is. Along with the planting, attendees enjoyed a reading of the Arbor Day Proclamation by Frankfort Mayor May, a Tree City USA Award and a Growth Award presentation. Local school children received art contest awards , as well as door prizes, music, food, exhibits, free t-shirts and a tree seedling for everyone to take home. A visitor views the artwork from Stuart Home in Frankfort, Ky.
Arts and crafts were a big hit with the kids that attended. Tree seedlings were one of the freebies volunteers received. To properly plant the trees, volunteers would first dig a hole deep and wide enough to accommodate the roots of the tree seedling. They would then place the seedling in the hole, backfill with dirt and place the “weed mat” over the seedling and pin the mat down. The weed mat has a hole in the middle for the seedling to grow through, and the mat prevents competition from surrounding vegetation during the early years of growth. Learn the proper way to plant a tree and see one of our professionals demonstrate the correct technique and talk about why reforestation is so important here,with Bridget Abernathy. Enter your email address to follow this webzine and receive notifications of new posts by email.